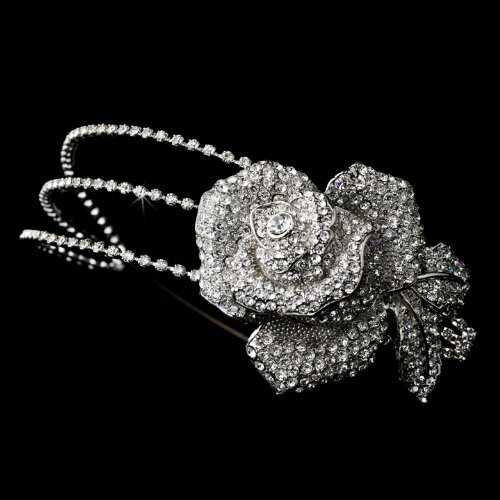 With sparkling rhinestone and Swarovski crystals, this headband is a three-strand piece lined with evenly-spaced clear rhinestones and prominently featuring a large silver-plated rose. You will be the belle of the ball with this unique and couture headpiece. The headband measures 14" in length; detailing measures 10" in length and up to 2 1/2" in width. Pin loops allow you to fasten the piece securely in your hair with bobby pins. If you have any questions about this product by IzzyGifts, contact us by completing and submitting the form below. If you are looking for a specif part number, please include it with your message. Jet Black Paillette Hat Haute Couture Stella Rhinestones "Bird Nest"